^ Rűdiger Overmans. Deutsche militärische Verluste im Zweiten Weltkrieg. Wikipedia. 2000: 335. ISBN 3-486-56531-1. ^ Frank Biess (2006). Homecomings: returning POWs and the legacies of defeat in postwar Germany. Princeton University Press. p.19. ISBN 978-0-691-12502-2. ^ Kontrollratsgesetz No. 34). It specifically says: "Because of paragraph I of proclamation nr. 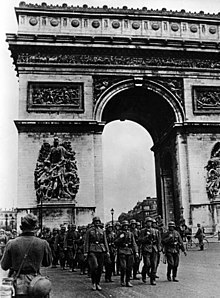 2 from September 20th, 1945, the Allied Control Council issues the following law:" - now it lists again the same institutions as above - but omits the SS, SA, SD and Gestapo and adds instead "The German war offices: Oberkommando der Wehrmacht (OKW), Oberkommando des Heeres (OKH), Reichsluftfahrtministerium (RLM) and Oberkommando der Kriegsmarine ... are hereby viewed as disbanded and fully liquidated and declared unlawful." Surprisingly the law says "are hereby viewed as disbanded and fully liquidated" and then it states that any attempt to violate the law will be prosecuted with up to the death penalty. In the mid-1950s, tensions of the Cold War led to the creation of separate military forces in the Federal Republic of Germany and the socialist German Democratic Republic. 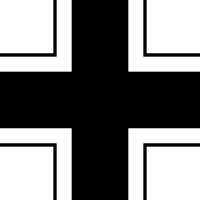 The West German military, officially created on 5 May 1955, took the name Bundeswehr, meaning Federal Defence Forces, which pointed back to the old Reichswehr. Its East German counterpart—created on 1 March 1956—took the name National People's Army (Nationale Volksarmee). 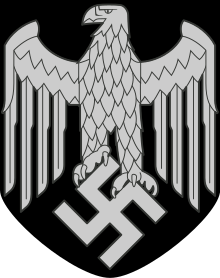 Both organizations employed many former Wehrmacht members, particularly in their formative years, though neither organization considered themselves to be successors to the Wehrmacht, and in the case of the Bundeswehr rejected the traditional grey of the Wehrmacht in order to show discontituity.